We have been making these beaded icicles for a long time. When Holly and I make them, we set up an assembly line and complete each stage before moving to the next. The icicles can be harder to make than they look like they should be. The difficulty lies in how you choose to form the top pipe cleaner loop and the end of the icicle. Pictured are two, an aquamarine beaded icicle and a clear icicle. While the aquamarine icicle is my favorite, we typically make clear icicles. I made the aquamarine icicle from beads leftover from a beaded angel which I recently made. On this page, I will give bead size and quantities for both. Because I have been asked a few times where one might purchase sunburst (starflake) beads, I have added links to amazon.com. The links go to search results for the particular bead style and while the links do not necessarily go to the exact bead, one can find the bead fairly easily via amazon's sort feature. Note, sunburst beads are more often called starflake beads. 1 package of chenille white pipe-cleaners which contains at least 25 pieces. The pipe cleaners are 12 inches long. You can add extra beads to the icicle, but make sure that each completed beaded icicle is a bit shorter than the 6-inch pipe cleaner. Leave at least 1/4-inch pipe cleaner clear of beads at the end the icicle. Cut all of the white pipe cleaners in half. Form a small hook on one end of the pipe-cleaner. Tweak the hook a bit so that the tip turns out a bit. Place a 12-mm crystal sunburst bead on the pipe-cleaner and tuck in the end of the pipe-cleaner into the bead. This is rather difficult, so an adult or older child should probably do all of the icicle "tops." Needle-nose pliers are useful for this step. Add 4 more 12-mm crystal sunburst beads. Add 5 10-mm crystal sunburst beads. Add 4 8-mm crystal faceted beads. Add 4 6-mm crystal faceted beads. Add 4 4-mm crystal faceted beads. Once you have added all of the beads to each icicle, make sure the beads are packed on the pipe cleaner tightly, then bend the remaining tip of the pipe cleaner at a 90 degree angle. With a wire cutter, trim the pipe cleaner to around 1/8th of an inch. Pull off the white fuzz. Using the side of the wire cutter pliers, bend the 1/8 th inch wire up against the last 4-mm bead. This keeps the beads from sliding off. *A messy alternative is to cut the wire flush with the last bead. Then remove the last two beads, add a light smear of white glue to the pipe cleaner, then slide the last two beads back onto the end of the icicle. Set aside to dry. At this point you can use store bought hangers. I prefer a "string" hanger. Take clear nylon string (or the string you have) and run it through the loop at the top. Cut it to the desired length, then knot the ends together. Bring the knot down to the loop at the top of the icicle and add a drop of glue. Set aside to dry overnight. NOTE: Quantities to purchase are unknown. I used leftover aquamarine beads. This can be altered, depending on the number of beads that you have. 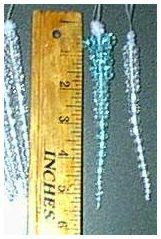 Follow instructions above to make the aquamarine icicles using the Quantity of beads per aquamarine icicle: as a guide for placement.